After one episode, I had some complaints about NBC’s Revolution (and yes, I tried another episode after that and it was just as hard to watch). 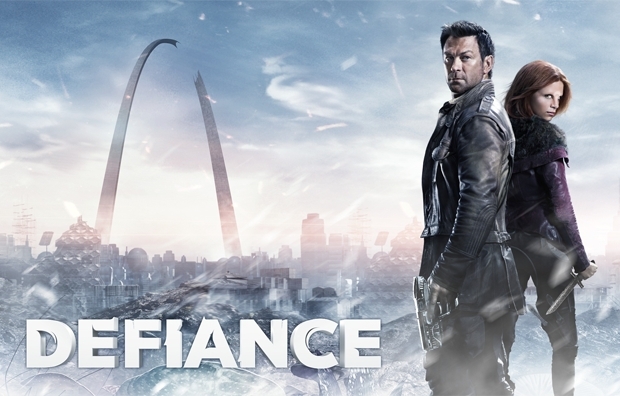 But so far, the only thing I really don’t like Defiance is that it’s only available on the web version of Hulu, which makes it much harder for me to find time to watch it. Luckily, Syfy took my advice (in the second to last paragraph of that post) and (according to Wikipedia) are only having 12 episodes in the first season. Also, they totally got me with the “Come As You Are” cover at the end of the second episode. I generally love popular music when used well in TV shows, and this was a cool cover of a great song which fit the idea of the montage it encompassed (almost a little too “hit you over the head with the theme” well). Posted on April 28, 2013, in TV and tagged Defiance, Revolution, Syfy. Bookmark the permalink. 2 Comments. I think Defiance is good enough. Sure moe can come from it and probably will, but it is entertaining and should succeed. 100% agree with you Joe (though I’m a few episodes behind now, I think with the video game tie-in, they spent enough time up front to make it something that can be sustained).